You can easily convert any audio to WAV, MP3, OGG, WMA, APE, FLAC, MP4, AAC, MPC. A convenient batch option is available. You can rip CDs and convert CDA to lossless or compressed formats. 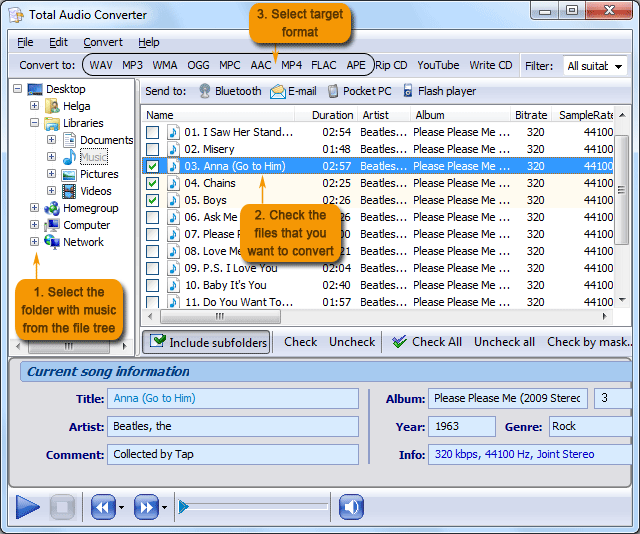 Total Audio Converter captures audio from YouTube videos. Just type in the url. We update TAC every time YouTube makes a new version. The program Wizard helps you make all your required settings. You always know what parameter to choose to get the perfect sound. You can convert audio files via the command line. If you need more information please contact the developers of Total Audio Converter (CoolUtils Development), or check out their product website.